The Foster Quick Connect is really made up of two parts. The #B22-2 Plug, and the #2022 Socket. 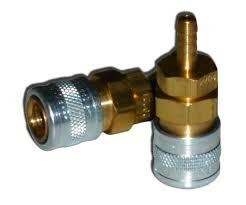 These are commonly used on pneumatic air systems and in auto repair places where they use pneumatic tools. These are "One Way Shut-Off Type" connectors. You need one #B22-2 plug for the trap and one #B22-2 plug for the pedal. The thread on the plug is 1/8 - 27 npt. The connecting hose is made with a piece of 1/4" tubing covered with 1/4" split wire loom about 10' feet in length with a #2022 socket on each end. The #2022 socket has a 1/8" hose barb so you attach to the 1/4" OD hose under the 1/4" split loom.